Here's a news that went under the radar: Luchi Cruz-Valdes, the news head of TV5's news division, is now officially part of the highly successful The Chiefs, the nightly talk program of One News. 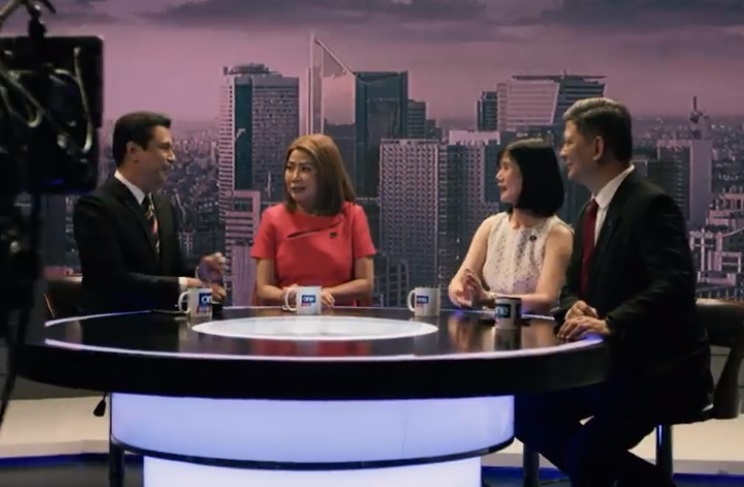 Cruz-Valdes, who is also the anchor of Aksyon, will now be seen on the program bi-weekly, every Tuesdays and Thursdays, via its election series Face The Chiefs, alongside Ed Lingao, Roby Alampay and Amy Pamintuan. You may recall that we reported back in May of last year that Cruz-Valdes would be part of the program. At the time of its launch, the Kapatid news chief was on sabbatical leave. Upon her return in July, there were plans to have her on board the program but they would eventually be scrapped due to scheduling conflicts with Aksyon. Cruz-Valdes is no stranger to the talk format having been the host of Aplikante and ReAksyon. But The Chiefs isn't anything remotely close to her TV5 programs as this Cignal TV production relies heavily on the collaboration between the hosts. Just last Friday, for example, the program scored an exclusive interview with former DFA Secretary Albert Del Rosario and former Ombudsman Conchita Carpio-Morales — their first since announcing that they have filed an ICC complaint against Chinese President Xi Jinping.